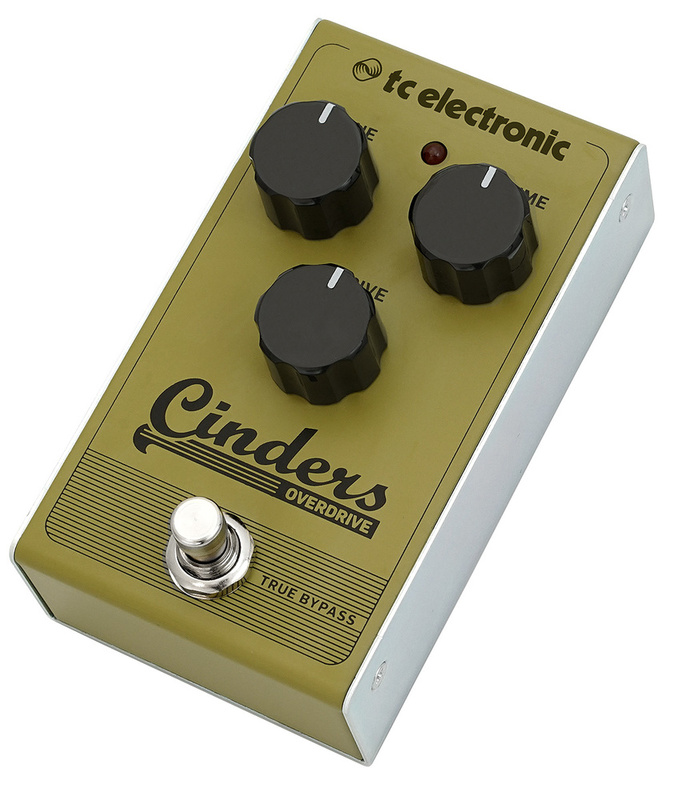 Since being acquired by Music Group, TC Electronic’s engineers have continued to add to their pedal line, and the three on review here are all based on traditional analogue circuitry. Their folded steel cases are a hint wider than most compact pedals, but as the jacks sit in the top edge of the box, rather than on the sides, you don’t waste space between pedals and can pack them pretty densely. Power can come from an optional 9V Boss-compatible PSU or a battery, and all three pedals have true bypass footswitches and effect-active LEDs. To access the battery compartment you have to remove (and not lose!) four cross-head screws. A nice touch is that the knobs are large and sensibly spaced, and the pots have a nice smooth stiffness to them, which means they’re more likely to stay where you set them. Cinders Overdrive: The Cinders Overdrive follows the usual format of Drive, Volume and Tone but has a surprisingly wide range, running from an almost clean boost to heavy rock saturation. In between are some very nice bluesy tones, for which your playing touch or guitar volume control changes can be used to vary the degree of drive in a very organic and amp-like way. Tone-wise, with the tone control set midway, the general character of the guitar remains unchanged — the original tonality shines through the overdrive harmonics and chords don’t dissolve into mush. Turn the Tone pot anti-clockwise and the sound smooths out but without becoming dull. Turn it clockwise and it gets brighter. I’d say this pedal is best suited to blues and classic rock — it’s not ‘gnarly’ enough for most metal styles — but for the intended application it has a lot going for it and really nails classic rock. Blood Moon Phaser: This four-stage phaser seems rooted in 1970s phaser tones, and its wide-ranging speed control combined with separate depth and feedback controls cover a lot of ground. Because of its traditional design ethos, there’s a little background noise but it’s not enough to worry you in live performance. If you hanker after that mellifluous soft sweep reminiscent of Hendrix’s ‘Little Wing’ or ‘Breathe’ from Floyd’s Dark Side Of The Moon, then you’ll probably appreciate the way this pedal delivers the appropriate effect without undermining the low end of your tone, as some phaser pedals seem to do. The effect becomes more watery and obvious as you turn up the feedback, and settings around midway sound very satisfying. The speed range goes from an excessively fast burble to a languid sweep that takes several seconds to complete. As with all phasers, you can get a different effect by placing the phaser before an overdrive pedal rather than after it, so try both to see which you prefer. 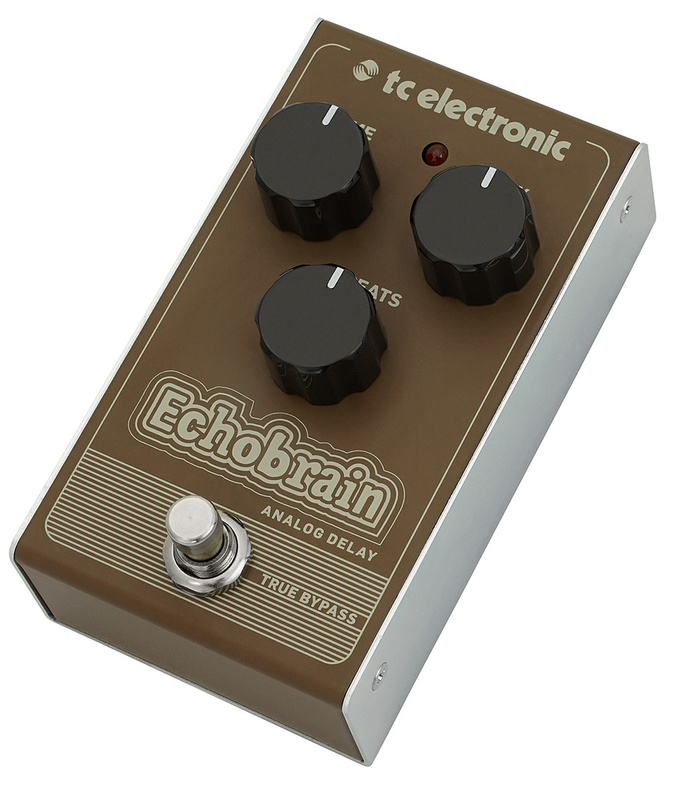 Echobrain Delay: Lastly we have the Echobrain, a delay based on analogue ‘bucket-brigade’ chips to deliver the delay equivalent of a comfortable pair of slippers. There’s up to 300ms of delay time on offer and as with traditional bucket-brigade designs, the longer the delay time, the murkier the echoes sound. Not only does this delay sound suitably lush, it is also very quiet, and although a 300ms delay time might be restricting for the occasional song, it will be long enough for most. The control layout is about as simple as it gets, with just Mix, Time and Repeat (feedback) controls. With a little feedback and maximum delay time you get that classic ‘Run Like Hell’ effect as you pound away on your D-string, but turn off the feedback and turn the delay time down to around a quarter way on and you get a near perfect rockabilly slap-back. Another trick you can do is to set the feedback knob at around one third and the Mix control midway, and then move the delay time manually between minimum and just shy of your rockabilly setting to create flanging effects. That’s because at minimum delay time and just above, the delay is far too short to distinguish, so you just hear comb-filtering as you change the delay time. All three of these pedals deliver classic analogue sounds, and to a high standard at that. The asking price makes them extremely attractive for both studio use and live performance. The build quality also seems to be compatible with life underfoot. While there are other pedals that do similar jobs, all three are affordable, they all operate over a very wide range and the control layout is easy to deal with. All pedals £39.99 each including VAT.